All the businesses listed on this website have been vetted, approved and continue to be monitored by Trading Standards, to help ensure you receive a quality service. Businesses are only included once they’ve completed a series of stringent checks, including a visit by a qualified Trading Standards professional. Those working in and around people’s homes will also be criminal record checked. 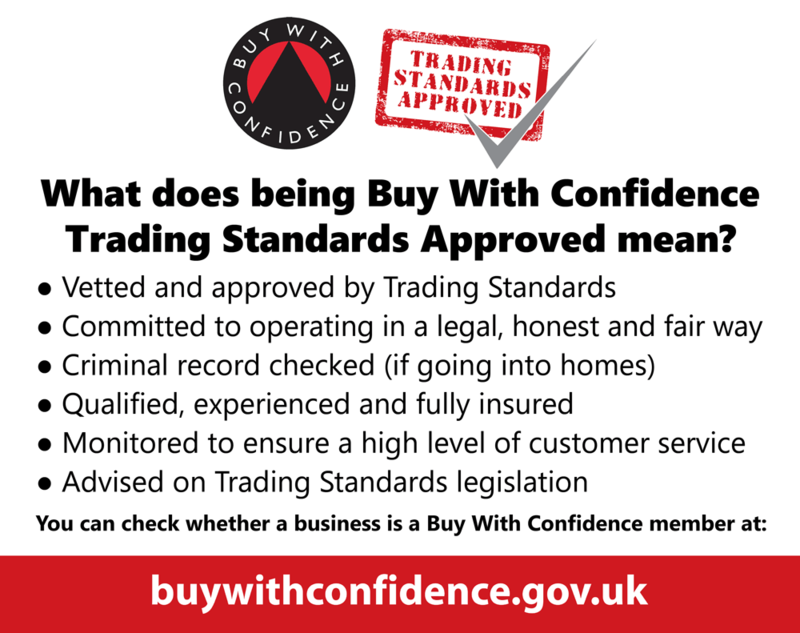 Buy With Confidence is a national register of Trading Standards Approved businesses run independently by local authority Trading Standards departments. Over 50 local authorities directly support the scheme – from Cornwall to Argyll & Bute (find a full list here) – having decided that Buy With Confidence offers the strong consumer protection that they think is vital. Find out more about the scheme and the benefits of using one of our businesses here. To help you choose an appropriate business for your needs, please complete a search and review the results – the business’ specialisms are listed for your convenience, you can also view feedback that has been left by previous customers.